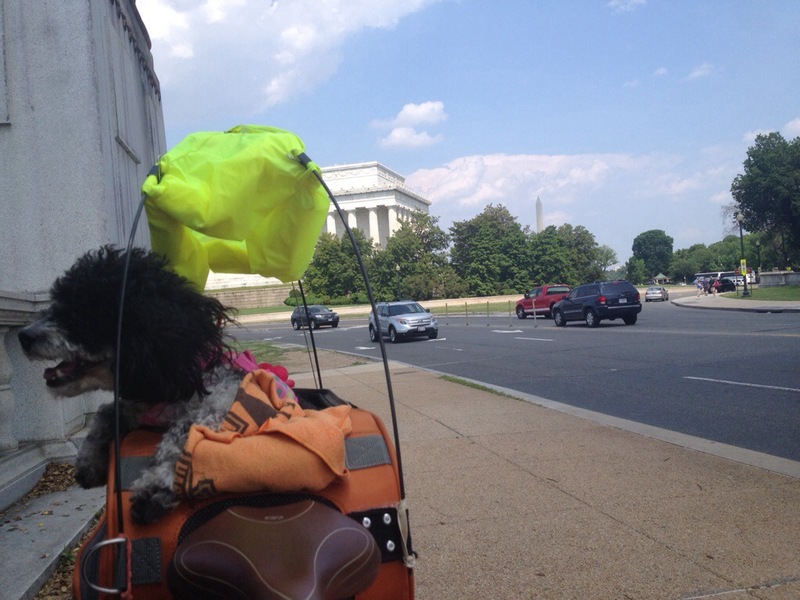 Yesterday we pedaled through to Chevy Chase Maryland and decided, after realizing the dearth of camping options and getting some advice about the places to avoid camping in the area, that we would try to reach out to connect with a possible Warm Showers host for the first time. It’s a network of cyclists who offer a shelter and/or shower and other amenities based on reciprocal hospitality. We’d heard good things about it, and boy, were we glad that we decided to give it a try. A cyclist named Frank guided us along the Rock Creek Trail through Bethesda until we called our hosts to confirm we would indeed make it over to their place for the evening. Our lovely hosts Betsy and Bill had an amazing chicken, quinoa and kale dinner waiting for us, some ingredients from their local CSA (Community Supported Agriculture) and some decadent Mayan Chocolate Pudding. Dessert was so delicious that we asked Betsy to share the recipe, which she kindly did. We were treated to fun conversation, a shower and a bed to curl up in after putting in a long day in the saddle. 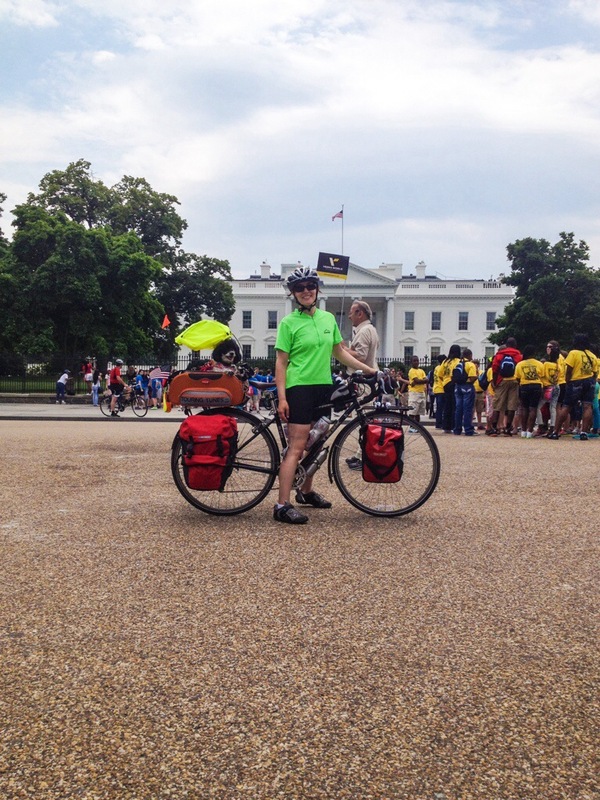 Having hosted several other bike tourists, Betsy and Bill had some great stories to share, including their encounter with Pablo Garcia, a man who has been on a mission to ride in 100 countries and has been touring by bike for ELEVEN YEAES. Pablo’s story sounded incredible and we were fascinated by how this man could live on a bicycle for so long. Betsy and Bill also offered breakfast and generously allowed us to take care of some much-needed laundry. Grateful doesn’t even begin to describe how we feel after meeting so many wonderful folks. 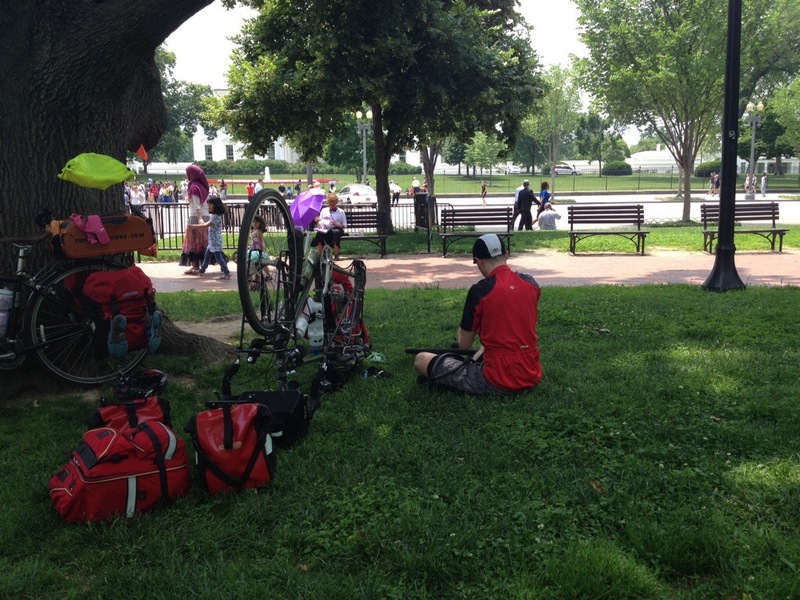 We cycled on through Washington DC today, and we stopped in front of the White House to take some photos and videos, when suddenly we heard “tttsssssssssss” and realized Greg’s rear wheel has gone flat. After an unsuccessful patch attempt, he replaced the tube with a new one and off we went toward the fun town of Alexandria. We replenished water, replaced the spare tube, and had some ice cream, before hitting the stellar Mount Vernon bike path. The smell of fragrant honeysuckle was heavy and the humidity was high. 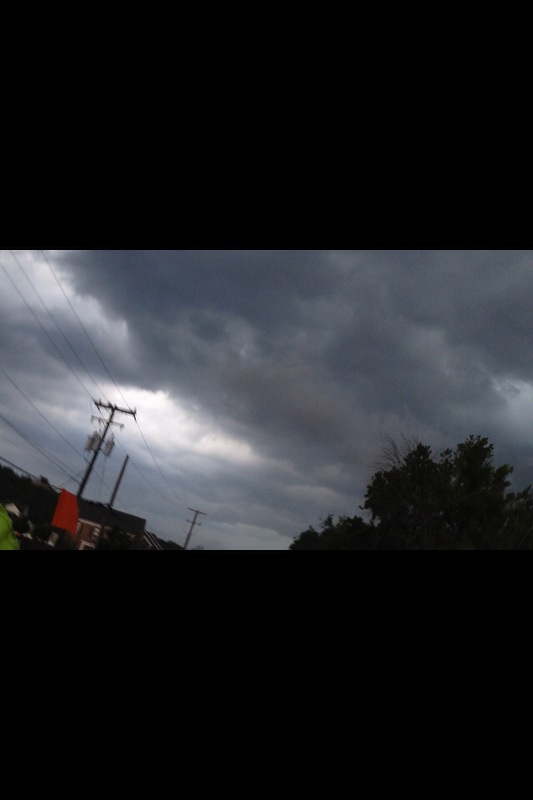 We planned to ride through to a campsite west of Fort Belvoir, but suddenly the rumored “passing storm” became a real threat and lightning and winds picked up. We took shelter under a gazebo just as the fat raindrops started to fall. Realizing that we likely wouldn’t make it to camp with the sun down and the lightning cracking overhead and that the military base would probably not approve of us throwing down a tent randomly on their property, we took a shot on Warm Showers again and to our great surprise, there was a host actually right on the base. Tim answered our call and our prayers and as we got to his location, the torrential rains started, soaking us all. Well, Petunia’s body stayed dry, but wanting to see what was going on, she stuck her head out of her rainfly and her face was soaked. It was quite a sight. Tim and his wife kindly offered us towels to dry off with, a garage for our bikes and gear, a wonderfully warm shower, and talked bike travel over dinner. Having done a cross country trip from the west coast to Maine, Tim said “doing a ride like this will restore your faith in humanity” because of the kindness, generosity, and support of the people you’ll meet along the way…. We couldn’t agree more. I’ve been reading your blog, all whilst dreaming about touring during retirement. I caught the Warm Showers reference, and immediately signed up for it! Oh how amazing it would have been on our 2003 tour from Portland, OR -Traverse City, MI. Hopefully, we’ll meet some bikers this summer! Hi Quilter! Thanks for checking out our blog. We have only had and heard good experiences with Warm Showers so far. We’d be curious to hear about some of the less fabulous stories. Happy riding!